Without a doubt, one of this year’s most eagerly awaited releases is Assassin’s Creed Origins, the next major instalment in Ubisoft’s world-conquering video game series. What’s most interesting about this upcoming Assassin’s Creed entry is that Ubisoft has abandoned the European and American settings of the more recent games, with this Assassin’s Creed game taking place in Egypt after it had been taken over by the Romans. And in order to show off the game and give you an idea of what to expect from this upcoming Assassin’s Creed game, Ubisoft released a gameplay trailer at this year’s E3 show, which shows Egyptian protagonist Bayek in action, as well as some of the new features included in Assassin’s Creed Origins. The game does look the part too, with ancient Egypt and its landmarks like the Lighthouse of Alexandria (one of the Wonders of the World) looking great in 4K resolution in this Ubisoft video. 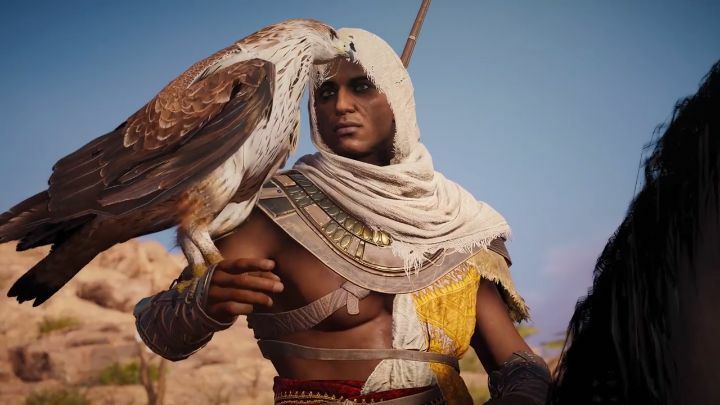 We also see protagonist Bayek riding through a Middle Eastern village reminiscent of the ones seen in the original Assassin’s Creed game, and using his trusty eagle to scout a large fortress in the middle of the desert, were his assassination target is hiding. But at least it looks like the assassination missions in Origins will be as involved and interesting as those in the earlier Assassin’s Creed Unity. And we see in this gameplay video how in this case this involves infiltrating a heavily-guarded compound in order to locate the target… It’s also nice to see the slow-motion effect when using the bow here, something that Ubisoft has borrowed from Nintendo’s smash hit The Legend of Zelda: Breath of the Wild. Something also worthy of note is that this Assassin’s Creed promises to offer quite a few boss fights, as we see protagonist Bayek having to deal with an unfriendly dude wielding a club before getting on with the business of finishing off his assassination target. Actually, game director Ashraf Ismail has said boss enemies will be commonplace in Origins, hopefully making this upcoming Assassin’s Creed game an even more exciting game to play through. It remains to be seen, though, whether Ubisoft can add enough new elements to this Assassin’s Creed and make the tried and tested formula of the series feel fresh again. But even if this mostly plays like the Assassin’s Creed games we’ve enjoyed over the years, it’s bound to become a big hit when it ships later this year.